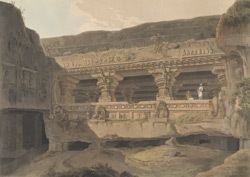 Plate 4 of 'Hindoo Excavations in the Mountain of Ellora near Aurangabad,' engraved by Thomas Daniell after the drawings of his deceased friend James Wales, which Daniell regarded as the sixth set of his 'Oriental Scenery.' Jagannatha Sabha is one of a group of five Jain caves dating to the 9th Century excavated under Rashtrakuta patronage to the north of the site.. The façade of this red granite rock cave consists of an architrave supported by heavy columns with cushion capitals and ridged shafts with animal brackets. Inside are sculptured figures of Parasvanath and Mahavira, two of the Jain founders.